Today’s modern media is full of examples of women behaving badly. There are shows dedicated to cat fights, scandals, and affairs. This bad girl behavior is glamorized and made to look funny and cute rather than showing the destruction the women are causing in their lives and the lives of others. 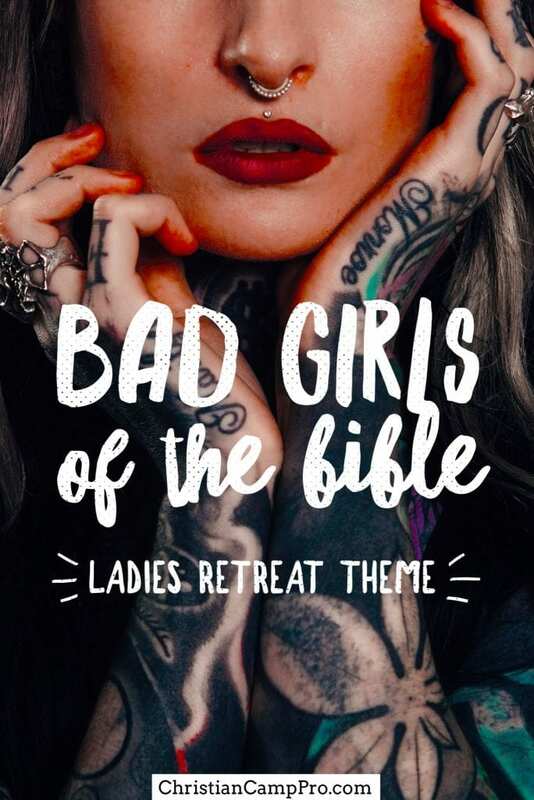 This retreat theme will deal with how NOT to be a godly woman of faith by taking a look at three notorious examples of Bad Girls of the Bible: Delilah, Jezebel and Lot’s Wife. 19 Then she let him fall asleep on her lap and called a man to shave off the seven braids on his head. In this way, she made him helpless and his strength left him. 20 Then she cried, “Samson, the Philistines are here!” When he awoke from his sleep, he said, “I will escape as I did before and shake myself free.” But he did not know that the Lord had left him. Delilah is the epitome of the treacherous woman. She has come to symbolize lies, seduction and betrayal. She used her beauty and feminine wiles to seduce Samson and ultimately find out the secret of his strength. She nagged, pouted and pestered him until he revealed the secret of his hair. Armed with this ill-gotten knowledge, she betrayed the man she loved for wealth. While her ultimate fate is not recorded in the Bible, she may have met her end in the temple of Dagon when Samson pulled the pillars down and crushed the Philistines inside. Even if she escaped this fate, she likely lived a pitiable existence, never satisfied, always craving more wealth and material goods, and destroying everyone she loved in order to get it. These days, the name Jezebel conjures up images of a shameless woman of questionable morals. Jezebel has become so infamous that her name is synonymous with attention-seeking and narcissism. She was a princess and pagan priestess so intent on having complete power that she threatened and destroyed anyone who opposed her. She swayed her husband, the weak king Ahab, away from the One True God and turned his heart to the worship of Baal. Jezebel lied and schemed and put her own desires above everything else. Her ambition eventually cost her life and she met a horrible end at the hands of her enemies. 24 Then out of the sky the Lord rained burning sulfur on Sodom and Gomorrah from the Lord. 25 He demolished these cities, the entire plain, all the inhabitants of the cities, and whatever grew on the ground. 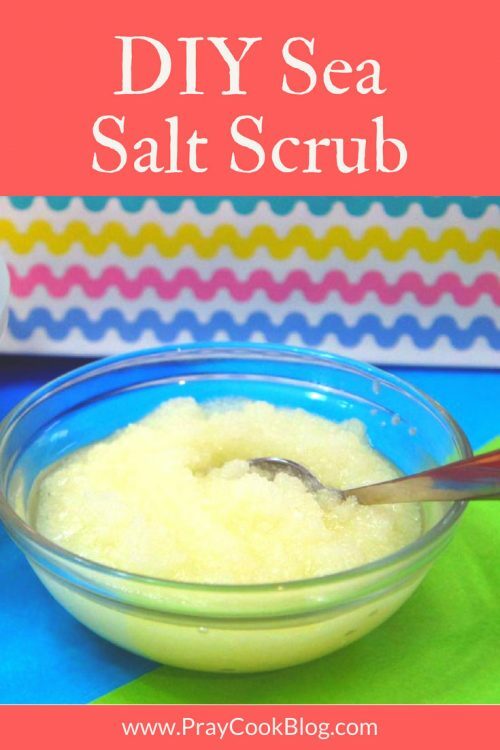 26 But his wife looked back and became a pillar of salt. The Bible doesn’t even record the name of Lot’s wife. We remember her only for the last act she ever performed: a backward glance. She and her family had been commanded to flee from the wicked cities of Sodom and Gomorrah. They had been spared from God’s wrath but had been given specific instructions to run and not look back. Lot’s wife showed not only a lack of faith but also an unholy attachment to the evil cities when she dared to take a peek behind her. She was immediately turned into a pillar of salt and went down in history as a woman known for her final act of disobedience. The crafts for this retreat theme are meant to be fun and a bit tongue-in-cheek. 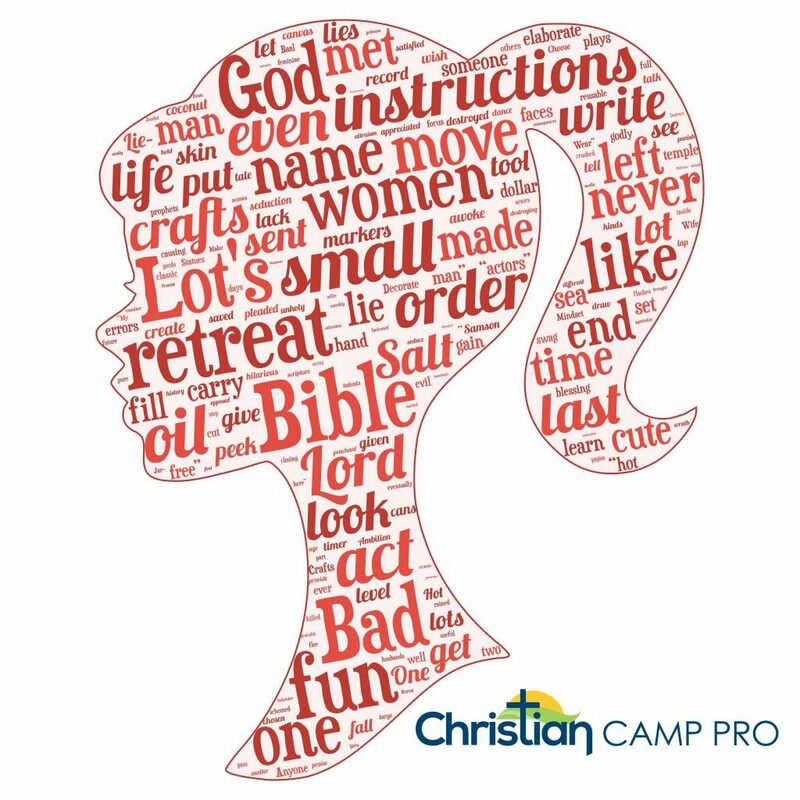 Rather than celebrating the examples of biblical bad girls, these crafts will focus on the what these women could have done with their talents. Jezebel is remembered for her narcissism, but your ladies can be remembered for their altruism. The kindness jar craft in the link is geared toward children, but it can be easily modified to fit any age level. Provide a variety of jars, cans or canisters and different colored papers and markers. Instruct the attendees to write down small acts of kindness that they can perform for their families, friends or even strangers. Decorate the jars in any way you wish and fill them with the slips of paper. The ladies can draw one out each day or on those occasions when they need to step away from Self and give someone else a blessing. Delilah’s deceptions were no laughing matter, but this fun get-to-know-you game is a hilarious way to break the ice with your retreat group. Each lady will write down three facts about herself, two of which are true and the other which is a lie. The facts should be a bit ridiculous or far-fetched in order to make it more difficult for the group to guess which facts are true and which is a lie. This is a lot like the classic game, but for this one the “hot potato” is a camera with a timer set. The ladies will sit in a circle and pass the camera around (pointed at their faces!). If the camera flashes while it’s in someone’s hand they get a funny selfie, but they’re out of the game. The last selfie-less lady wins. This fun freeze game is a great game for large groups. Have all the ladies gather into an open area of the room. Tell them that when the music plays, they can dance or move around the area, but when the music stops they must immediately freeze in whatever position they may be. Anyone caught moving after the music stops is out. The last person standing wins. The ladies will be leaving your retreat loaded down with lots of crafts, goodies and take-homes. They will need something to carry all their retreat loot. A cute swag bag will be more than appreciated. You can go as simple as dollar store gift bags or as elaborate as reusable printed canvas bags. Make sure the bags are as colorful and fun as your retreat has been. It’s a great way to stir up interest in future events! This fun activity pulls retreat leaders into the action to recreate a scene or scenes from the theme scripture passages. The leaders are the “actors” and can talk and interact with each other to act out the scene. However, they can only move with the help of a few chosen attendees. These “helpers” must move and position the actors in order to create the scene. This a very fun game and works as either a closing or opening activity. Despite their less-than-stellar reputations and their penchant for misdeeds, we can learn a lot from these bad girls of the Bible. 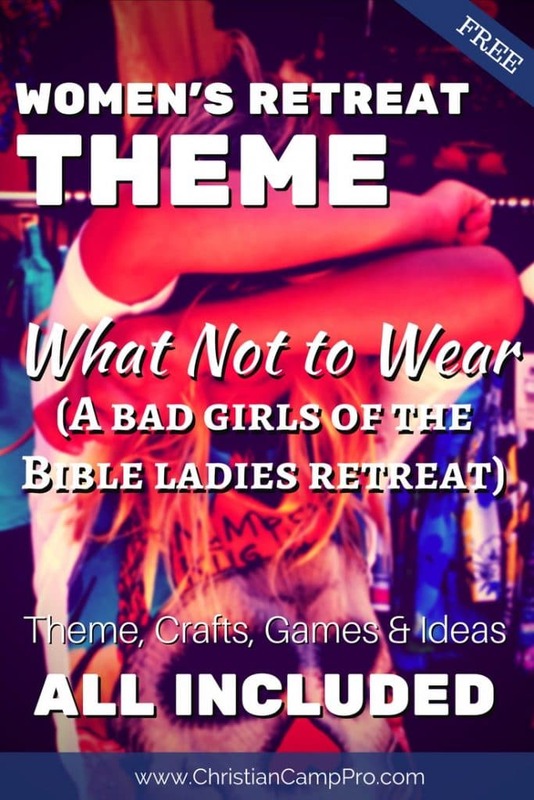 A Bad Girls “What Not to Wear” retreat can help women see the errors in the ways of Delilah, Jezebel and Lot’s wife. It can be a useful tool in teaching ladies that those kinds of behaviors have disastrous consequences. Being a bad girl is not glamorous or desirable, but being a woman of God is something that is always worthy of praise. Interested in a similar retreat theme for men? Check out these bad boys of the Bible.